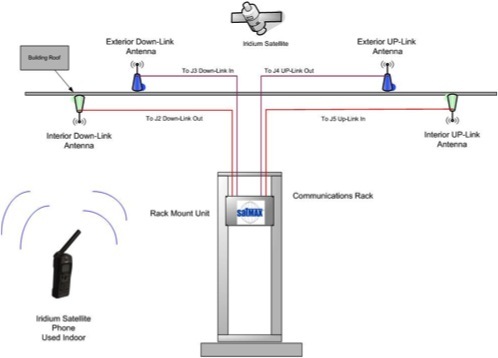 The SatMAX unit that is available today repeats 3 simultaneous users of the Iridium signal to allow 3 phones, 3 data modems or any combination, to work at the same time in the "hot spot" created by the indoor antenna connected to the repeater unit. Universal Repeater LLC is also developing repeaters for the Inmarsat, Terrastar and Globalstar Constellatons. The SatMAX Repeater is one box with 2 indoor cables and antenna and 2 outoor cables and antenna for a complete uplink system and a complete downlink system included. Universal Repeater LLC is able to create a mobile Satellite "Hot Spot Satellite Dial Tone" Service in your buidling. This is accomplished by installing, owning and operating the equipment to create a service for a monthly recurring cost. This allows the customer to use a maintenance or services budget instead of use capital dollars to have the Sattellite Repeater functionality working in your non-line of site location. Copyright 2012 Universal Repeater,LLC. All rights reserved.